Rav Besdansky was a member of the Agudath Harabonim. In your link it says tha he was the Moreh D’Asrah of the Chevra Tehillim Kehilla in Brooklyn besides being a R”M in RCB. He was 48 years old when he passed away. My apologies, the word “only” was mistakenly left in the sentence and changed it’s meaning. My grandfather was Abraham Besdansky born Vlnius 1878. I live in Australia and I’m trying to connect with my extended family in the USA. Eliezer Tzi Besdansky was my paternal grandfather. The name was Americanized in the 1930’s, changed to Besdin. My father was Rabbi Abraham Besdin most likely named after your grandfather. Most Besdins live(d) in NYC; some live in Israel. I look forward to hearing from you. 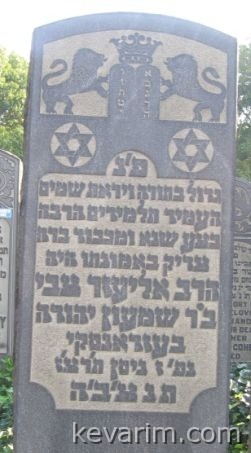 Moshe & Avroham, sons of R. Besdansky were brothers. The only remaining sibling lives in Israel and is in her mid 90’s. That remain sibling was Getrude (Gita) Sternfield. She passed away this past Friday in Jerusalem, and was buried next to her husband in Eretz Hachaim cemetery. Her two sons live in Jerusalem, and her daughter (my mother-in-law) lives in Baltimore. All of them are sitting shiva in Jerusalem.